Preface Why a tournament? Efficiently organized tournaments for rifle, pistol, & air gun are easy to conduct. Members meet each other and learn to work together successfully. A tournament provides classification and experience for new shooters. Local shooters can travel to other matches or can compete at their own club. Tournaments can be a source of club income. A tournament also provides the means for repaying other clubs for tournaments they sponsor. Tournaments promote the shooting sports and provide a means for club publicity. They will interest new shooters, attract outside visitors, and provide a general means of telling the world about recreational shooting. 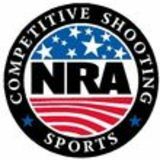 The prime reasons for holding tournaments is to give competitors an enjoyable shooting experience, and to further support NRAâ&#x20AC;&#x2122;s mission. Tournament sponsors accept a responsibility to conduct the tournament, efficiently, fairly, and according to the rules. This book promotes the NRAâ&#x20AC;&#x2122;s Competitive Shooting Division system of Tournament Operations. It is intended primarily as a primer and reference for tournament sponsors. 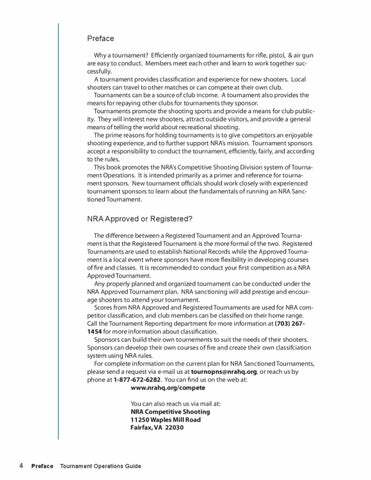 New tournament officials should work closely with experienced tournament sponsors to learn about the fundamentals of running an NRA Sanctioned Tournament.